The cool thing is, the folding pocket book is as long as you want to make it! Keep in mind the longer you make is, the thicker it will be when you fold it up. We recommend 7-8 craft sticks lined up together. 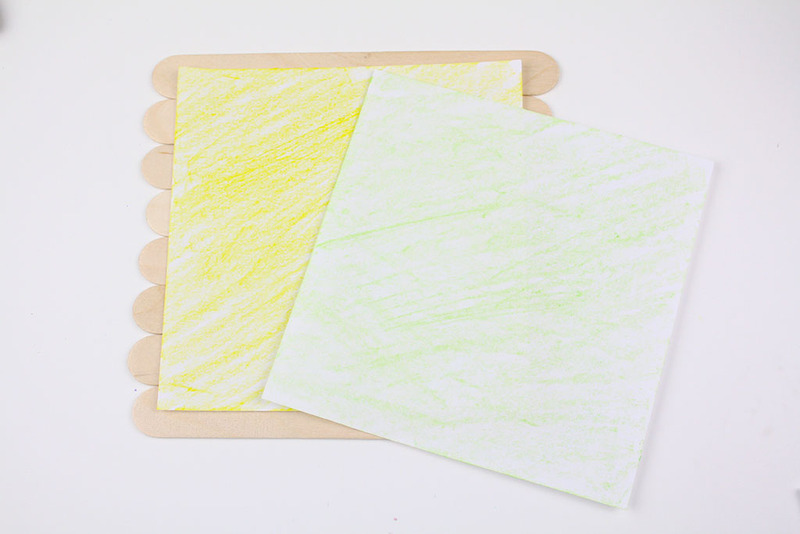 You can do this two ways, you can use masking tape to hold the sticks together or you can use tacky glue. Ella and Annie prefer the tacky glue so you can have a front and back to your folding pocket book. 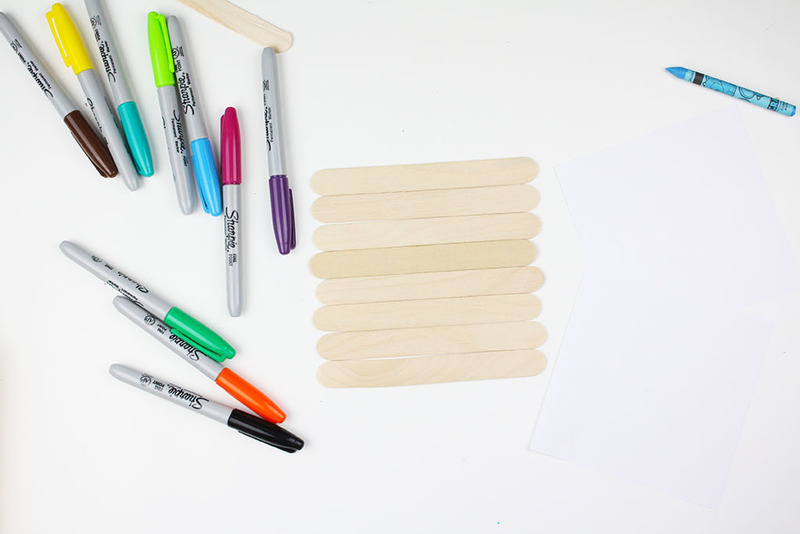 After you line the craft sticks up (length wise), cut a piece of printer/copy paper the size of your craft sticks. We left a little room for a border so the kids could decorate it later. Then the kids used crayons to shade in the background of their paper. 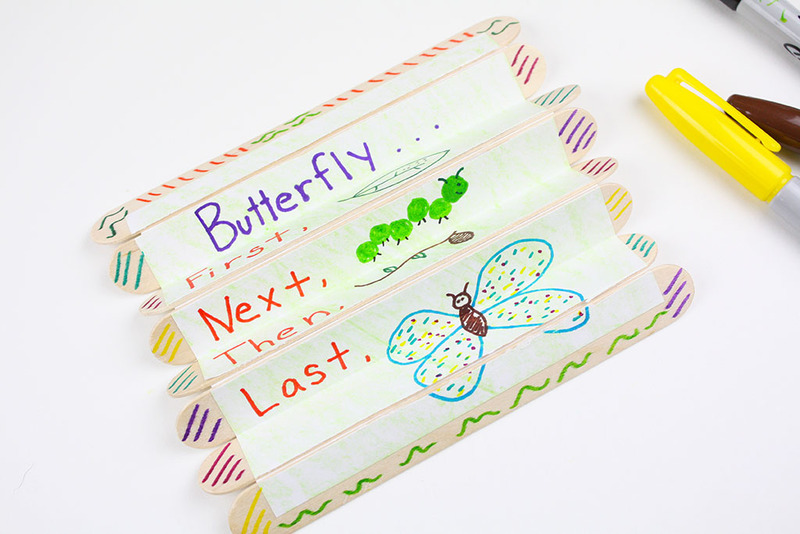 Now it is time to decorate your Folding Pocket Life Cycle Craft! 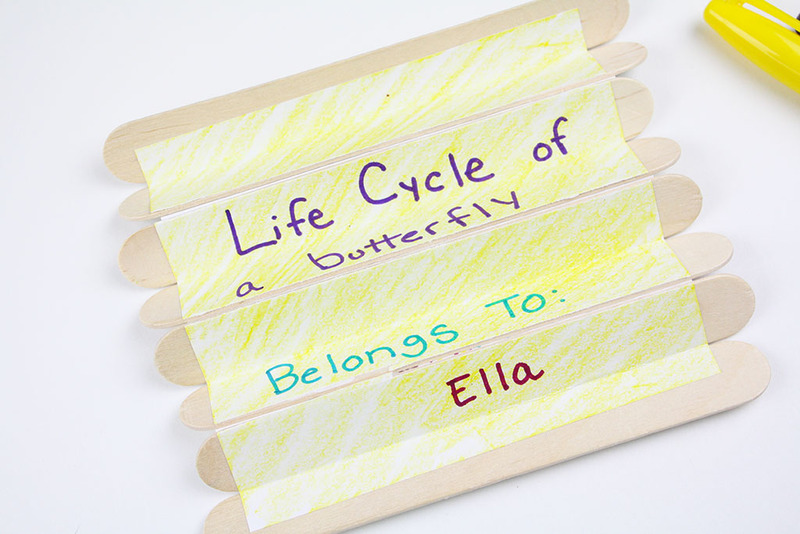 The girls chose to do the life cycle of a butterfly. We kept it simple with first, next, then and last. At each stage they drew a picture using sharpies. The sharpies work well over the crayon. Spread the tacky glue on the backs of your paper, makings sure it’s a thin layer. 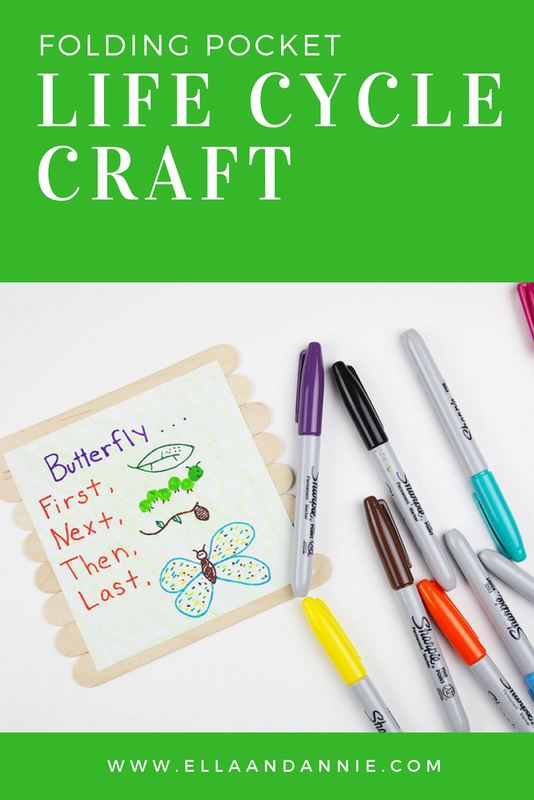 Press the paper on top of the craft sticks you lined up. Repeat on the other side of the crafts sticks. Let the glue dry. 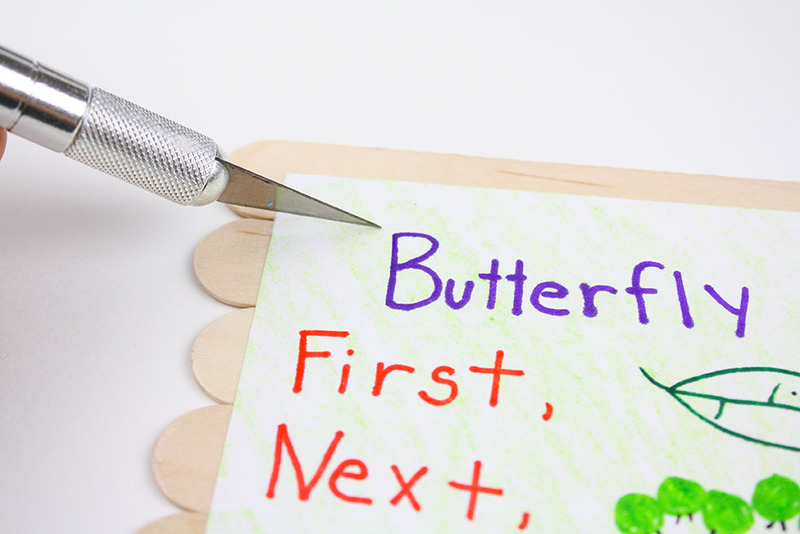 Once the glue is dry, with the help of an adult, take a craft knife, starting at the top gently cut the paper across the craft sticks creating a perforations. Repeat with every other craft stick. Turn over the craft sticks and cut the opposite sticks, starting with the second row. Break apart the sticks where you cut them. Tip: do not cut all the way through. 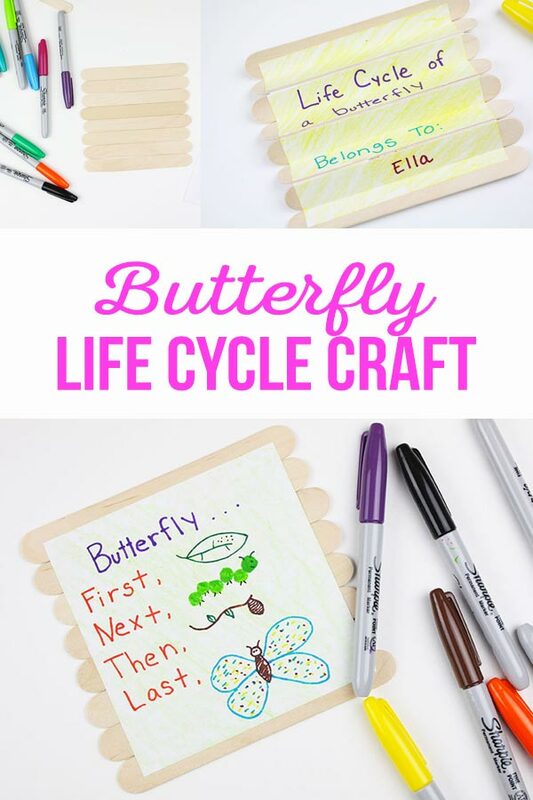 How cool is this Folding Pocket Life Cycle Craft? Accordion fold your pocket life cycle books and tie with some string. We just love how these turned out! Visit Ella and Annie on Instagram and make sure to follow us on Pinterest! This is cute idea. 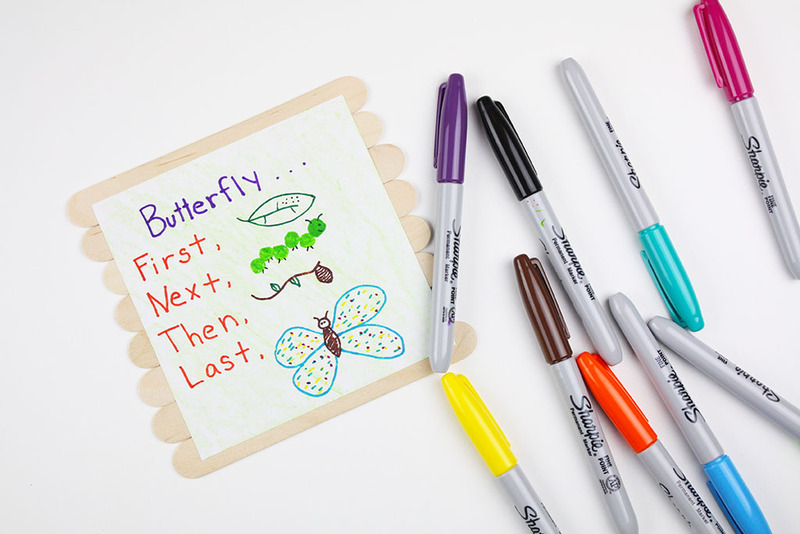 A fun way to learn about the life cycle of a butterfly.